Netflix has officially made its first foray into original programming with its first series Lilyhammer now available for US streaming customers. All eight, 45-minute episodes of season one are available to view in their entirety, which sees a change to the week-by-week format we're used to seeing in episodic TV shows. Lilyhammer stars former The Sopranos favourite and E Street Band guitarist Steven Van Zandt reprising his gangster persona once again. Van Zandt plays a mob boss who is relocated to Lillehammer in Norway as part of the witness relocation programme, after he turns in his former associate. 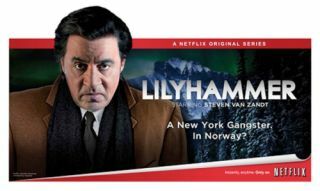 Lilyhammer, as Van Zandt's character calls it, is only available to US-based Netflix customers at the moment, but it has already been a huge success on Norwegian TV. The show has pulled in a record 1.2m weekly viewers in the country. UK-based mob fans will be able to watch the show on BBC Four after Netflix signed a distribution deal with the corporation.